Khaled Elamrawi is the president of Brightskies. He co-founded the company in 2012, with focus on providing professional software services globally in the areas of automotive software development, and High Performance and Cloud Computing. Prior to his current role at Brightskies, Dr. Khaled Elamrawi was Intel’s Regional Director for Enterprise Solutions and services in the Middle East. Prior to taking on that role Dr. Elamrawi was Intel's General Manager, Egypt, Levant and North Africa. Before that, Dr. Elamrawi was director of Intel’s Platform Definition Center based in Cairo. The Cairo center is one of the four that Intel opened worldwide to define, plan and develop specific products for the Middle East, Turkey and Africa region. Dr. Elamrawi joined Intel in 1999 as a senior process engineer with Intel’s Portland Technology Development Group, developing lithography processes for Intel’s leading manufacturing technologies. He also contributed to the startup of Intel’s first 300mm wafer fab in Oregon. Prior to his move to Egypt in 2005, Dr. Elamrawi was a launch marketing manager with Intel’s Business Client Group, responsible for the worldwide launch of Intel’s desktop platforms including microprocessors and chipsets. 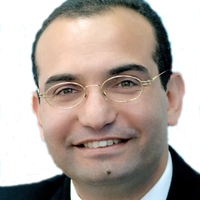 Dr. Elamrawi was born in Alexandria, Egypt in 1968. He received his Bachelor and Master degrees in 1991 and 1994 from Alexandria University, Egypt, his Ph.D. from Old Dominion University in Virginia, all in Electrical and Computer Engineering, and received his Executive MBA from University of Oregon in 2004.